Tanja Erhart in CounterAct by Candoco. Photo: Hugo Glendinning. When watching dance performances, there are usually one or two dancers who stand out more than the rest. This may be because they are cast in the lead role – as in the case of traditional ballet – and so you watch Sarah Lamb or Lauren Cuthbertson in a swooning daydream, seeing the rest of the cast as only one syncopated backdrop to her lovely movements. With Candoco Dance Company in their currently-touring work Beheld, this is not the case. No one dancer is illuminated more than the others and for the majority of the piece they move as one combined being, supporting and facilitating the movements of others. Despite being just 30 minutes long, this piece naturally separates itself into distinct ‘acts’ and in doing so feels like a microcosm of a much longer work. The metallic sheeting of the stage design appears at first static and industrialist, before visually morphing to reveal its fabric texture. The fluidity from metallic solid to waving liquid mercury finds its echo in the movements of dancers banging down from precipices before being swept back up into the amorphous whole by another entwined figure. It is like watching multi-limbed trees bashing beautifully together in a storm. Ever present is a sense that we are always on the terrible verge of destruction. Branches could cause others to snap, bruise, fall, but instead they battle in interlocking, gentle strokes, introducing a playfulness to this scene of potential destruction. 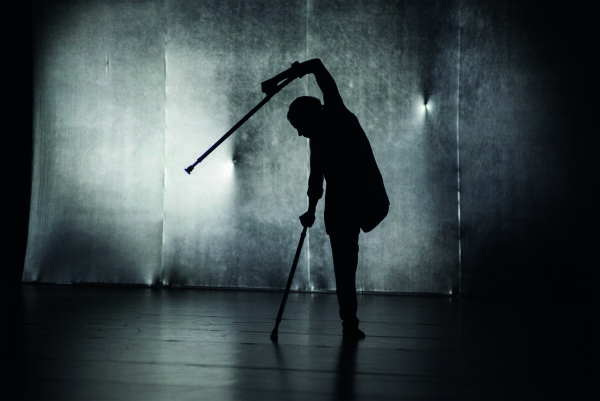 Candoco are a dance company of disabled and non-disabled dancers. The presence of the disabled dancers creates a tendency to read all of their works as being inherently about disability. However, there is a more general metaphor at work in this performance that goes beyond thinking about how disabled and non-disabled people move around and with one another. It can be extended to act as a much wider depiction of how we all move together as a nebulous mass. How our individual movements impact on others who we can choose to knock down or sweep up. Those whose movements we enable and those that we forcefully or neglectfully impair. Following the quicksilver beauty of the first half, the interval is followed by a complete change in tone. In this half there is no question that we will be interpreting the piece as anything other than about disability, as this is less about dance and far more about Candoco explicitly discussing the company and issues relating to disability. Let’s Talk About Dis is an interesting piece on its own, although its combination with Beheld jars somewhat – quite possibly deliberately. The use of humour in the piece makes it a very accessible way of engaging with the comments the company make, and comedy can be a brilliant way of discussing disability, as shown by Francesca Martinez time and again. However at moments it feels like more depth is required and the comedy is just keeping everything on an easy-to-swallow plane. Anecdotes from the personal experiences of the cast are presented, but not really developed. This openness could be seen as part of the discursive nature of the piece – they are providing questions, not answers – but it would have benefitted from at least some of the thoughts being taken further. In a related manner, the underlying notion that ‘we need to talk about this (because we don’t)’ and presented assumptions about what we, as audience members, would be thinking about a woman with one arm, provoked anger in me. I resented being told what I thought about disabled dancers, because that statement relied on presuming that we in the auditorium were all non-disabled and/or had not contemplated these things previously. Five years ago the majority of my curved spine was straightened with titanium rods and the base vertebrae fused. For the past seven years, the problems associated with this, particularly in respect to chronic pain, have seeped black liquid into all corners of my life and will continue to do so. I have thought about disability a lot and I was particularly interested in seeing Candoco perform in Bristol because of my experiences (and because I love watching dance). Furthermore, I would hazard that I was not the only one sitting in the audience on Friday in part because they hadn’t spent their life floating by in an entirely non-disabled bubble. The inherent problem of staging this type of discussion – and one that is by no means the fault of Candoco – is that the audience who choose to attend are often those familiar with the topics being discussed. This was certainly true when I used to haunt Feminist discussions. The audience were nearly always female Feminists well-versed in everything from Sappho to Betty Friedan to Vagenda and back again. They didn’t need to be converted because they already were, but the speakers would stridently scream at the non-present patriarchy. I agree with Candoco that we should be talking about Dis. But it needs to be a discussion in the true sense, one in which no one is assumed to hold viewpoints they may or may not have. We also need to think about the blurred lines between disabled and non-disabled and the way people can move between the categories at different moments of their lives. We need to think about visible and non-visible disabilities. And most of all we need to think about going to watch Candoco perform more often because, above anything else, they are a brilliant group of dancers. For more information on Candoco, including tour dates, click here.